In her book ”Cropcircles” Janet Ossebaard wrotes ”In cropcircles is found up to 700 times more magnetite as normal”. Magnetite here are small spheres of magnetic iron, very well visible under a microscope, whirling down every day as meteoric dust. Every magnet consists of one North pole and one South pole. The two magnetic poles of one single magnetic dust particle attract each other, thus contributing a little to its coherence. Here we treat magnetic dust particles as small spheres. The magnetic north pole of a dust particle is attracted by the magnetic south pole of the earth, which actual is (nearly) at the geographic North Pole by common agreement. So in fact the north pole of the particle wants to go north. On the other hand due to the earth magnetic field the south pole of the particle wants to go south. In fact the earth magnetic field tries to tear the particle apart. (This doesn’t succeed - the magnetic field of the earth is too weak. Besides, when on breaks a magnet into two halves one obtains two new magnets, not two separated poles.) The earth magnetic field is that big that it can be assumed of equal strength and direction all over the dust particle. So the force that urges the magnetic north pole of the particle to go north equals the force urging the magnetic south pole of it to go south. Thus the particle will not be set in motion due to the earth magnetic field. As one can see, the force field working on magnetic particles - magnets - coincides with the magnetic field. The motion of magnets in a magnetic field resembles that of electric charges in an electric field and is not guided by something complicated as the Lorentz force. Force lines and magnetic field lines are the same now. Several aligned dust particles, if near enough to each other, should form strings. If a second string happened to lay aside the strings should stick together. In this case the geometric preference of sticking (bumps of one string fits into holes of the other) coincides with the magnetic preference of lay (N and S poles nearest to each other), providing the dust particles to remain their alignment along the magnetic field line. If the particles are going to twist a little the outcome may be different, by example the magnetic alignment direction of the particles might point outside the flat plane shown here. 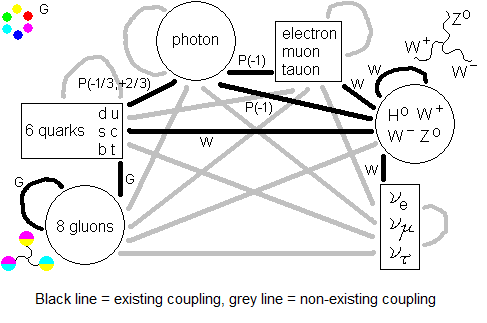 The attraction between the neighboring dust particles in one single string is stronger than the attraction of neighboring particles of neighboring strings, if such a configuration would keep its shape. That is because the latter have a little larger distance relative to each other than the first and the force between magnets drops as the square of their mutual distance. But as far as I can see a coherent plane of equal directed magnetic dust particles should be possible. If you put a second plane like that just above the first then the neighboring particles of the two planes would repel each other. But when you move one plane along the other over one red arrow distance while keeping the planes parallel, then mutual attracting magnetic poles are above each other everywhere. So I expect touching planes trying to take that position. A coherent filled-in space of aligned magnets should be possible. But the planes are made of spheres. The geometrical bumps of one plane then do not fit the best into the holes of the other plane. For that a displacement over the green arrow would be the best. So in practice one would expect parts of such a structure being laid according to the red arrow displacement while other parts are laid according the green arrow displacement. Probably parts will be allowed to shift easily between the two states, giving the resulting structure some unexpected flexibility. These structures are not observed normally, I suppose because the magnetic field of the dust particles and the earth magnetic field is too weak and the density of dust is to low. But when the density is increased hundreds of times and the dust is guided by a stronger magnetic field things may be different. Shortly after midnight until well after sunrise of June 22, 2003, brilliant orange lightning bolts without thunder, rain or wind shot around the sky. We were at Knapp Hill, which remained unaffected; the orange lightning bolts were at the horizon in front of us. The air was very calm and still near Avebury. The lightning was hitting the ground as well shot between clouds. Orange lightning appeared in the form of a momentary circular glow in the clouds as if they had been punched through by a giant cookie cutter. The orange lightning bolts frequently occurred in pairs separated by less than a second. At 7 am wind picked up speed, dark clouds blew over, a barrage of small hailstones and heavy rain felt down, and there was normal looking, blue white lightning and ear splitting thunder. The orange color, the enhanced frequency of lightning and the lack of thunder all the time suggests a “weaker” kind of lightning because of a lowered electric insulation of the air. Electric charge doesn’t have to build up that high and discharges earlier, at lower voltage. The earthcurrents need this to invade the air easily. What causes the electric insulation to lower? A bit of dust suspended in the air like additives to an alloy? WHAT KIND OF DUST? Electric fields in the air (and magnetic fields too, in case of wind) may locally cause one side of an air molecule being a little positively charged and the other side a little negative (charge separation). IF such ”charged“ molecules (the molecules as a whole are electrically neutral) act as CONDENSATION NUCLEI, they may account for the strange shapes of clouds, large as well as small ones. The cloud’s shape then depicts electric or magnetic field areas of sufficient strength. One can imagine most damp will precipitate there where the field strength and dust density is highest: at the circlecurrent. It has been reported more than once that the actual appearance of a cropcircle is hidden from sight by such a sudden local appearance of damp or mist. Such charged molecules locally might enhance conductivity, as well as the precipitated damp does, useful for the earthcurrent to invade the air. For the circlecurrent this MIGHT help to fill in dust ring gaps, completing the circuit - but might cause short circuit as well. Weather phenomenons like whirlwinds and the plasma vortices of Terence Meaden might be CAUSED by this kind of electric phenomenons. Maybe a gigantic structure of ion tubes did build up there and when the wind picks up the ion tube structure distorts and breaks down. The dust is blown away and normal situation is restored.